Ibtasan, Arshi, Farzana and Rafique grew up in an impoverished pocket of South Kolkata. Their houses are small rectangular boxes, just enough to fit one bed. Families dine and sleep in a one room house. But that has not deterred them from dreaming. Ibtasan was 11 years old and in fifth standard when she first attended the children’s club. Today she is 22 and pursuing her final year Bachelor’s degree in Social Work. Her childhood friends Arshi and Farzan are her classmates too. They decided to study Social Work and Farzana says World Vision India has had a lot of influence in different stages of their lives, even their profession. “We decided to study social work because we saw World Vision’s work and were inspired by it. We wanted to make positive contribution in the community,” said Ibtasan. World Vision India has helped nurture her dreams. At the children’s club they have attended countless awareness and capacity building trainings, and they were able to translate the lessons they learned to a much bigger platform. They were World Vision India children’s club’s leaders. They are now National Trainers for ‘Play for Peace’ and have visited and trained 28 Area Development Programmes (ADP) in more than 10 states. “We have been able to visit so many places because of ‘Play for Peace’ trainings: from Madhya Pradesh to Mizoram, Manipur and many places we would otherwise have never known,” said Ibtasan beaming with excitement. They just returned from a training at Chhimtuipui ADP in Mizoram. With the aim to empower children, they started a non-profit organisation called Anughrah Peace Foundation (APF) in 2016. Ibtasan, Arshi and Farzan are presented their foundation at the United Religions Initiative’s third Asian Assembly 2018 held in Sri Lanka from 5th to 7th October 2018. “There were representatives from many big organisations and it was a great learning experience for us,” said Farzana, swiping her phone screen as she shows photographs of the event. World Vision continues to have strong presence in South Kolkata. Rose, 17, a leader of Little Stars children’s club has been part of many awareness programmes in the community through street performances. Once the performance started, around 300-400 people gathered at the small junction. Traffic slowed down and the lights and eyes were on the stage. “We are doing a campaign on child trafficking and online abuse. 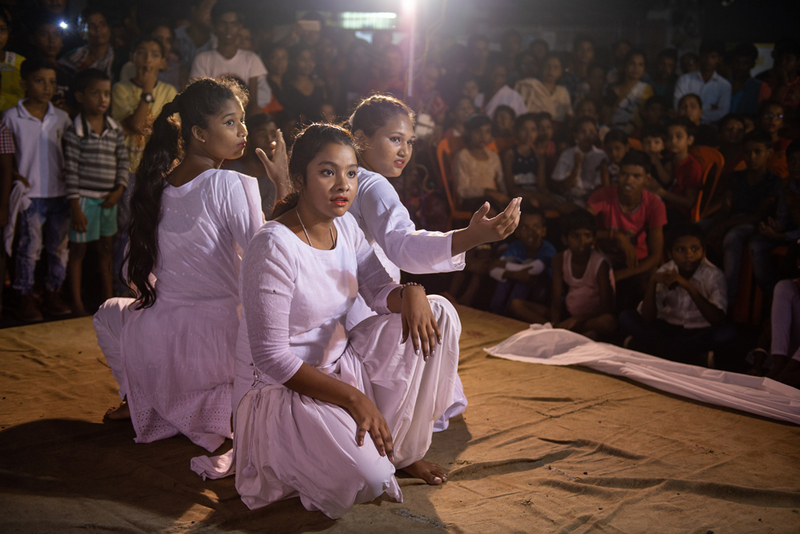 We have a choreography on online abuse, a child trafficking skit based on real incidents we read in newspapers and a dance performance of girl child abuse and infanticide,” said Rose. At the children’s club they learned about safe and unsafe touch, child protection, child trafficking, child rights, Life Skills and Education for Transformation (LSET) etc. They meet every week to discuss relevant issues. Rose and her friends are closely working with Child Protection Unit and community- based organisations to raise awareness on Child trafficking as Kolkata is high up on that list. Rose narrated an incident where she received a fake call from someone pretending to be from State Bank of India. The person on the phone kept asking her account number even though Rose does not have an SBI account. She recollected the lessons she learned in children’s club and handed the phone to her father. She said social media abuses are also quite common among children. 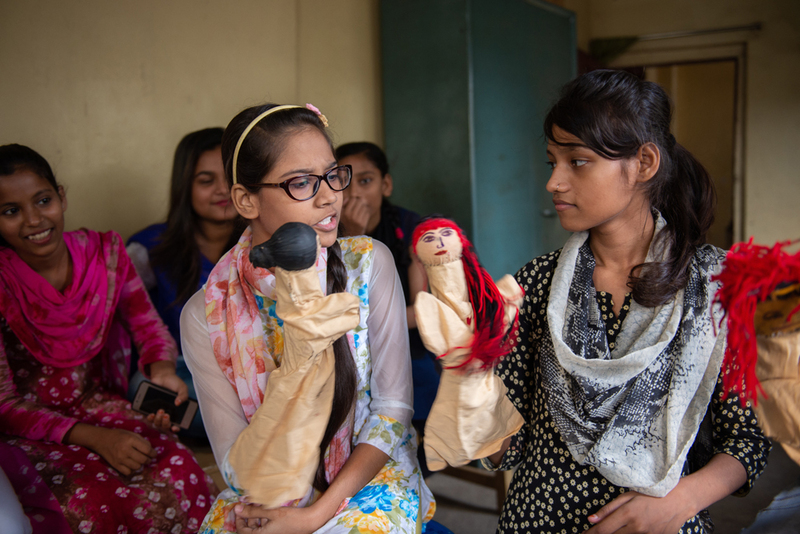 APF is building a resource team of around 45 children: each group of 6-7 members will be trained in various fields like choreography, puppetry, play, reporting, videography etc. They will then become facilitators. “We created our own module and the first module training is complete. We will organise another training soon,” said Rafique who is part of the four-member core team of APF. Rafique is a gifted painter and make-up artist. APF offers scholarships for few students who cannot afford to attend school. Children who dropped out of school get a second chance. This is such a noble cause and it comes with some sacrifice for all the APF members who shelled out certain percentage from their little earnings. Ibtasan is taking a cabin crew training course apart from her studies. Arshi is learning fashion designing and Farzana attends choreography classes. Together, they run APF. Their passion is to empower children. They want to give back what they have received. I know you all are the best guys.